Serine/arginine (SR) protein-specific kinases (SRPKs) are conserved in a wide range of organisms, from humans to yeast. Studies showed that SRPKs can regulate the nuclear import of SR proteins in cytoplasm, and regulate the sub-localization of SR proteins in the nucleus. But no nuclear localization signal (NLS) of SRPKs was found. We isolated an SRPK-like protein PSRPK (GenBank accession No. DQ140379) from Physarum polycephalum previously, and identified a NLS of PSRPK in this study. We carried out a thorough molecular dissection of the different domains of the PSRPK protein involved in its nuclear localization. By truncation of PSRPK protein, deletion of and single amino acid substitution in a putative NLS and transfection of mammalian cells, we observed the distribution of PSRPK fluorescent fusion protein in mammalian cells using confocal microscopy and found that the protein was mainly accumulated in the nucleus; this indicated that the motif contained a nuclear localization signal (NLS). Further investigation with truncated PSPRK peptides showed that the NLS (318PKKGDKYDKTD328) was localized in the alkaline Ω-loop of a helix-loop-helix motif (HLHM) of the C-terminal conserved domain. If the 318PKKGDK322 sequence was deleted from the loop or K320 was mutated to T320, the PSRPK fluorescent fusion protein could not enter and accumulate in the nucleus. This study demonstrated that the 318PKKGDKYDKTD328 peptides localized in the C-terminal conserved domain of PSRPK with the Ω-loop structure could play a crucial role in the NLS function of PSRPK. Serine/arginine (SR) protein-specific kinases (SRPKs) represent a class of evolutionarily conserved kinases that specifically phosphorylate the arginine/serine-rich (RS) domains of the SR splicing factor . After the identification of SRPK1–the first SRPK–by Gui et al. [2, 3], other SRPKs such as SRPK2 , mouse SRPK1 and SRPK2 , yeast Dsk1  and Sky1p , nematode SPK-1 , Trypanosoma cruzi TcSRPK , and Arabidopsis thaliana SRPK4  have been subsequently identified. Some studies have shown that SRPKs are mainly localized in the cytoplasm, with only a few present in the nucleus [[2, 5], and ]. The SRPKs that are localized in the cytoplasm regulate the nuclear import of SR proteins via phosphorylation , while those in the nucleus regulate the nuclear localization of the SR splicing proteins via phosphorylation [13–15]. Ding et al. have discovered that the spacer sequences present between the conserved domains of mammalian SRPKs have cytoplasmic anchoring function. However, there has been no report on the nuclear localization signal (NLS) of SRPKs. Model organism Physarum polycephalum is mitochondria-containing primitive eukaryotes. Its life cycle includes a single-celled amoeba, plasmodium (the main life form), and sporulation stages. The nuclei in the same plasmodium proliferate by way of synchronization of mitosis. In our previous study, we identified an SRPK containing 426 amino acids (aa) from P. polycephalum; this kinase was termed PSRPK (GenBank accession No. DQ140379). Similar to other SRPKs, PSRPK also has 2 conserved domains and can phosphorylate human SR protein alternate splicing factor/splicing factor 2 (ASF/SF2). However, it differs from other SRPKs in that the divergent motif (≥ N) in its N-terminus is rich in acidic amino acids; the spacer sequence of PSRPK between two conserved domains is shorter than that of other SRPKs. In this study, the distribution of PSRPK fluorescent fusion protein in mammalian cells was observed using laser scanning confocal microscopy. Maximum fluorescence was detected in the nucleus, suggesting the existence of an NLS in PSRPK. When the distribution of truncated PSPRK peptides was observed, a putative NLS was found in the C-terminal of PSRPK based on its homology to the classic NLS. When the sequence was deleted or when lysine 320 in the sequence was substitute by threonine, the cytoplasmic distribution of PSRPK was observed. pMD18-psrpk had been constructed previously . PSRPK fragments were obtained by polymerase chain reaction (PCR), using pMD18-psrpk as the template and PSRPK-specific primers (Table 1). The resulting PCR fragments and the mammalian expression vectors pDsRed1-N1 and pECFP-C1 (Clontech) were digested with Eco RI and Bam HI. The digested fragments were subjected to agarose gel electrophoresis, recovered from the gel, purified, and ligated using T4 DNA ligase; this resulted in the expression plasmids pDsRed-psrpk and pECFP-psrpk. We designed the following truncated PSRPK peptides (Figure 1): TP1 (≥ N deletion), TP2 (spacer sequence and CD2 deletions), TP3 (≥ N and CD1 deletions), TP4 (≥ N, CD1, and spacer sequence deletions), TP5 (without the 318PKKGDKYDK326 and 329DHLALMIELLG339 sequences), TP6 (containing 318PKKGDKYDK326 and 329DHLALMIELLG339 sequences), TP7~TP9 (all without the 318PKKGDKYDKTD328 sequence; further, TP7, 329~426 aa; TP8, 197~317 aa combined with 329~426 aa; TP9, 1~317 aa combined with 329~426 aa). Recombinant plasmids were constructed using the primer pairs (Table 1) and the pMD18-psrpk, pDsRed1-N1, and pECFP-C1 vectors, resulting in pECFP-tp1~pECFP-tp4, pDsRed-tp5, pDsRed-tp6, pDsRed-tp7, pDsRed-tp8, and pDsRed-tp9. Distribution of fluorescent fused PSRPK in mammalian cells. a and b: DAPI staining nuclear of cells HeLa and L929 containing pECFP-psrpk were observed under a BX51 fluorescent microscope (Olympus, 400×); c and d: distribution of CFP-PSRPK in cells HeLa and L929 were observed under a confocal microscope (TCS SP2, Leica). In order to understand the effect of the loop motif on nuclear localization, we designed default PSRPK, namely, PSRPKd (318PKKGDK323 deletion) and mutant PSRPK, namely, PSRPKm (K320 → T320 mutation). The DNA fragments containing psrpk d or psrpk m up- and downstream were obtained using the primers listed in Table 2 and pMD18-psrpk as the template. The 2 overlapping PCR products were mixed in a ratio of 1:1, followed by denaturing at 94°C for 3 min and annealing at 55°C for 3 min. Since there were 18 complementary bases (underlined parts of primers, Table 2) in the 2 PCR fragments, they would be complementary to the cohesive ends during annealing at 55°C. The DNA with 5' and 3' overhangs could be extended by DNA polymerase (Hot Start Taq Polymerase; Qiagen) to form a complete DNA fragment at 72°C. Primer pair F4/R3 were introduced in the PCR reaction for the amplification of the psrpk d and psrpk m sequences. The 2 PCR products, psrpk d and psrpk m , were inserted into pDsRed1-N1, resulting in the recombinant plasmids pDsRed-psrpk d and pDsRed-psrpk m , respectively. The abovementioned recombinant plasmids were used to transform E. coli DH5a cells. The positive recombinant products were grown in Luria-Bertani (LB) medium containing 30 μg/ml kanamycin. The plasmids were isolated using the alkaline lysis method, dissolved in Tris-EDTA (TE) buffer, and quantified using GeneQuant pro (Amersham Bioscience, GE Healthcare). The purified plasmid (A260/A280 > 1.8) was diluted to 16 μg/ml in serum-free RPMI-1640 medium (Gibco). Lipofectamine™ 2000 (Invitrogen) was diluted in serum-free RPMI-1640 medium (40 μl/ml) and then mixed with an identical volume of plasmid solution, resulting in lipid-DNA complexes. HeLa and L929 cells (ATCC) were cultured in RPMI-1640 medium supplemented with 10% fetal bovine serum (FBS; Hyclone), 100 IU/ml penicillin, and 100 μg/ml streptomycin at 37°C in a 5% CO2 incubator. The cells were harvested while they were in the logarithmic phase and 1.5 ml culture (approximately 1 × 105 cells) was seeded into a 35-mm plate with a coverslip and cultured for 24 h. The medium was replaced with serum-free RPMI-1640 medium, and the cells were cultured for 1 h to initiate transfection. The cells were overlaid with 200 μl lipid-DNA complexes and cultured for 5 h. The medium was replaced with 1.5 ml of 10% FBS medium, and the cells were further cultured for 48 h.
The HeLa cells were transfected with pECFP-psrpk, and L929 cells were transfected with pECFP-psrpk, pDsRed-psrpk, pDsRed-tp5~pDsRed-tp5, pDsRed-psrpk d and pDsRed-psrpk m as described above, respectively. The transfected cells were incubated on a coverslip for 48 h, following which DAPI staining (Bitian) was performed for 5 min. The cells were washed 3 times (each wash, 5 min) with D-Hands solution to remove DAPI. Fluorescence was visualized under a fluorescence microscope (Olympus BX51, 400×) or a confocal microscope (Leica TCS SP2, 1000×) at 465~495 nm (green) or 560~600 nm (red) in order to observe the distribution of the fluorescent fusion protein in the cells. The three-dimensional (3-D) PSRPK structure was modeled by the Swiss Institute of Bioinformatics program SWISS-MODEL, available at http://swissmodel.expasy.org/, and the results analyzed by the DeepView program . 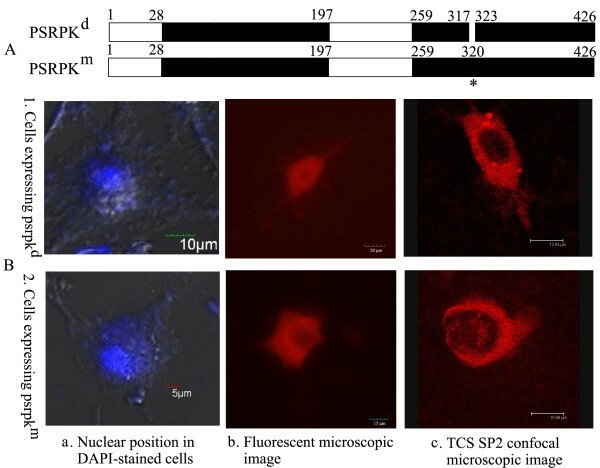 The DAPI-stained nucleus of cells HeLa and L929 transfected with pECFP-psrpk were clearly observed under UV excitation (Figure 2a, b). Confocal microscopy showed that the distribution of cyan fluorescent protein (CFP)-PSRPK was non-uniform and that this protein was expressed mainly in the nucleus of the HeLa (Figure 2c) and L929 (Figure 2d) cells. Schematic diagrams of truncated PSRPKs compared with PSRPK. TP1~TP7: Peptides containing the PSRPK aa 29~426, 1~195, 196~426, 259~426, 197~317, 197~343, and 329~426, respectively; TP8: peptides containing 197~317 aa combined with 329~426 aa; TP9: peptides containing 1~317 aa combined with 329~426 aa. N: acidic divergent motif; 1~28 aa; CD1: conserved domain 1; 29~195 aa; CD2: conserved domain 2; 259~426 aa; spacer sequence: divergent motif between the 2 conserved domains; 196~258 aa. NLS: 318PKKGDKYDKTD328. The expression and distribution of CFP fusion TP1, TP2, TP3, and TP4 in mammalian cells were observed by confocal microscopy. 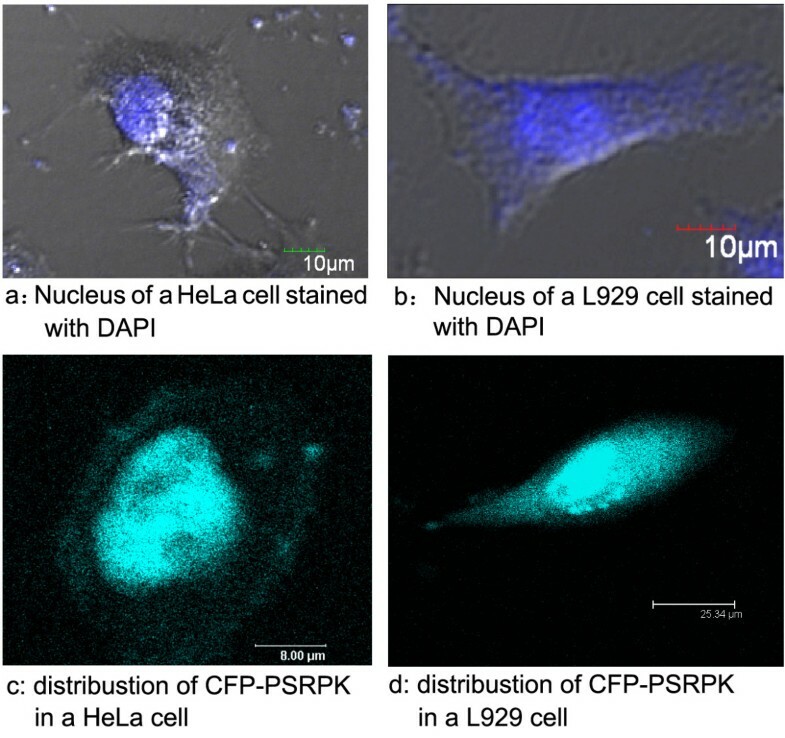 Compare with the DAPI staining of the nucleus (Figure 3a, b), the distribution of CFP-TP1 in HeLa (Figure 3c) and L929 (Figure 3d) cells was similar to that of CFP-PSRPK, i.e., both mainly accumulated in the nucleus. This suggested that the deletion of ≥ N had no significant effect on the nuclear accumulation of PSRPK. The distributions of CFP-TP3 and CFP-TP4 in HeLa (Figure 3g, i) and L929 (Figure 3h, j) cells were similar to those of CFP-PRPK and CFP-TP1, i.e., both mainly accumulated in the nucleus. This indicated that PSRPK continued to accumulate in the nucleus despite the deletion of ≥ N, CD1, and the spacer sequence and that CD2 contains an NLS peptide. Unlike the distributions of CFP-PSRPK, CFP-TP1, CFP-TP3, and CFP-TP4, CFP-TP2 in HeLa (Figure 3e) and L929 (Figure 3f) cells exhibited diffuse distribution. 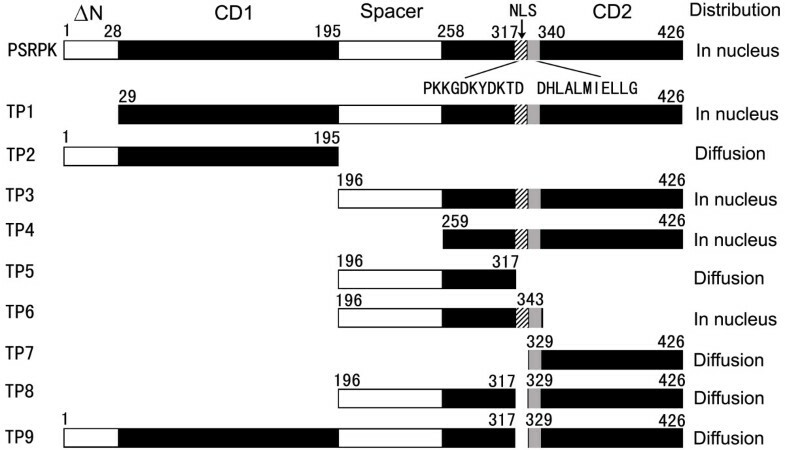 The results above indicated that the ≥ N, CD1, and spacer sequence deletions did not influence nuclear localization of PSRPK and that an NLS was located in the C-terminal conserved domain of PSRPK. Distribution of CFP-TPs in the mammalian cells HeLa and L929 observed under a confocal microscope (TCS SP2, Leica). The images a and b show DAPI staining nucleus of cells HeLa and L929; the images c and d, e and f, g and h, and i and j show CFP-TP1, CFP-TP2, CFP-TP3, and CFP-TP4 expressions in the HeLa and L929 cells, respectively. 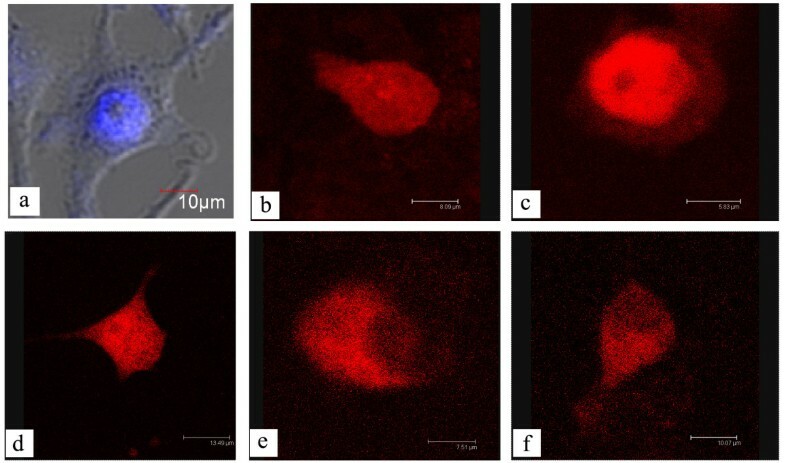 Confocal microscopy revealed that RFP-TP5 and RFP-TP7 were uniformly distributed in the L929 cells (Figure 4b, d), indicating that there was no NLS in the TP5 and TP7 sequences. However, RFP-TP6 mainly accumulated in the nucleus (Figure 4c), indicating that an NLS existed in TP6. By comparing the amino acid sequences of TP5, TP6, and TP7, we primarily confirmed that PSRPK NLS was located in 318PKKGDKYDKTD328. RFP-TP8 and RFP-TP9 were mainly distributed in the cytoplasm (Figure 4e, f); this further indicated that PSRPK and TP3 lost the ability of nuclear localization after the deletion of the abovementioned sequence. Thus, we could confirm that 318PKKGDKYDKTD328 was the NLS sequence of PSRPK. Distribution of RFP-TP5~RFP-TP9 in L929 cells observed by a confocal microscope (TCS SP2, Leica). Only RFP-TP6, which contained 318PKKGDKYDKTD328, accumulated in the nucleus. a: Nucleus of a pDsRed-tp6-transfected L929 cells stained with DAPI and observed under a BX51 fluorescent microscope (Olympus, 400×), while TP8 and TP9 are peptides obtained by the deletion of 318PKKGDKYDKTD328from TP3 and PSRPK, respectively. b, c, d, e, and f: Expressions of RFP-TP5~RFP-TP9 in L929 cells. Analysis of the secondary structure of 318PKKGDKYDKTD328 within PSRPK by DNASIS v2.5 Demo revealed that it was a β-turn (Figure 5A). Based on the crystal structure of SRPK1 and Sky1p , the tertiary structure of PSRPK (Figure 5B) was predicted using SWISS-MODEL software [18–20]. 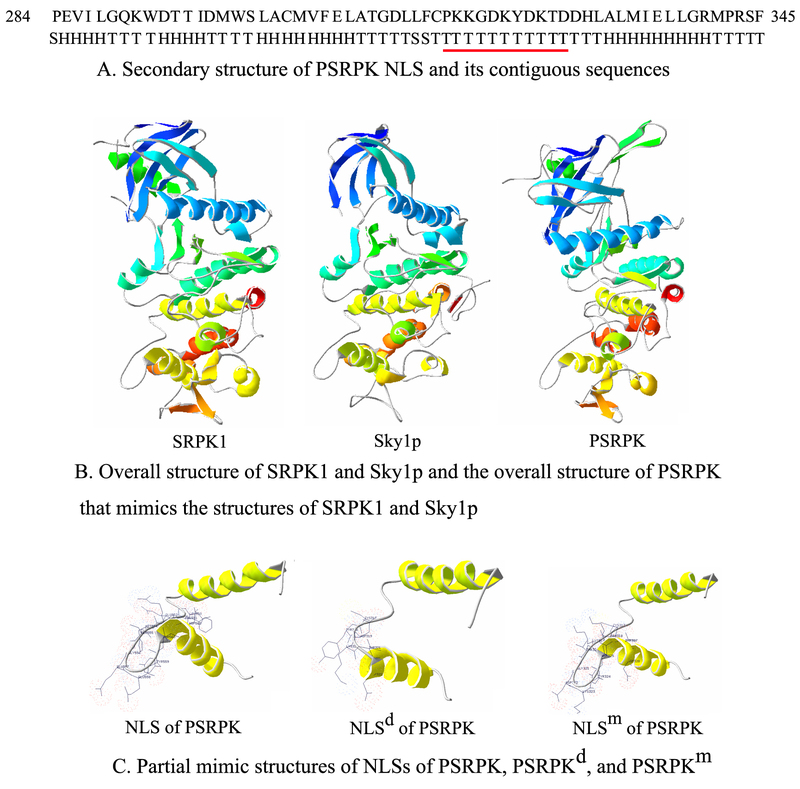 Figure 5B shows that the structure 318PKKGDKYDKTD328 mimics that of the corresponding sequences of SRPK1 and Sky1p. All the 3 sequences are located in the C-terminal loop motif. The spatially near K320 and D325 may form a salt-bridge via their side chains, causing the 318PKKGDKYDKTD328 to form a stable Ω-loop. This structure of 318PKKGDKYDKTD328 changes after 318PKKGDK323 deletion or K320 → T320 mutation, as predicted by SWISS-MODEL software (Figure 5C). 318PKKGDK323 deletion causes damage to the Ω-loop motif, and K320 → T320 mutation damages the salt-bridge in the Ω-loop. A: Secondary structure of PSRPK NLS, as predicted by DNASIS v2.5 Demo. The capital H, S and T blow the sequence represent the corresponding amino acid above has more probability to form helix, sheet or turn. B: The overall structure of PSRPK that mimics the structures of SRPK1 and Sky1p, as predicted by SWISS-MODEL online and displayed by SWISS-Pdb viewer compared with the overall structure of SRPK1 and Sky1p [17–20]. C: NLS, the NLS of PSRPK; NLSd, the NLS of PSRPK without 318PKKGDK323; NLSm, the NLS of PSRPK with the K320 → T320 mutation. The fluorescent fusion proteins PSRPKd and PSRPKm in the L929 cells are shown in Figure 6. Compare with the DAPI staining of the nuclear (Figure 6B1a, B2a), the fluorescent signal of RFP-PSRPKd and RFP-PSRPKm was observed in cytoplasm (Figure 6B1b, B2b). Further, confocal microcopy revealed that RFP-PSRPKd and RFP-PSRPKm were mainly distributed in the cytoplasm (Figure 6B1c, B2c); this indicated that the 318PKKGDK323 deletion or K320 → T320 mutation destroyed the structure of PSRPK NLS, resulting in PSRPK losing its ability of nuclear localization. A: Schematic diagrams of default PSRPK and mutant PSRPK compared with PSRPK. B: Distribution of RFP-PSRPKd and RFP-PSRPKm expression in L929 cells. PSRPKd, default PSRPK without 318PKKGDK323; PSRPKm, mutant PSRPK with the K320 → T320mutation. 1 and 2: Distribution of RFP-PSRPKd and RFP-PSRPKm expressions in L929 cells observed under a confocal microscope (TCS SP2, Leica) compared with their position in the nucleus in DAPI-stained cells observed under a BX51 fluorescent microscope (Olympus, 400×). Ding et al. studied the cell localization of mammalian SRPKs and found that almost all SRPKs without spacer sequences are accumulated in the nucleus, indicating that there is a cytoplasm localization signal in the spacer sequence between the conserved domains. Kuroyanagi et al. speculated that mouse SRPK1 might have 2 potential NLSs that are located in 11~21 aa and 265~277 aa; thus, mSRPK2 may have a potential NLS in 264~276 aa. However, direct evidence of NLS sequences in SRPK family members has been lacking thus far. Laser scanning confocal microscopy revealed that RFPs of default PSRPKs containing 318PKKGDKYDKTD328 mainly accumulated in the nucleus of mammalian cells, while the PSRPKs in which the abovementioned sequence was deleted did not accumulate in the nucleus. This indicated that the NLS of PSRPK was located in the 318PKKGDKYDKTD328 sequence of the C-terminal conserved domain. Further, Ding et al. showed that mammalian SRPKs were mainly distributed in the cytoplasm. However, the results obtained in our study showed that PSRPK was mainly expressed in the nucleus of the mammalian cells. A comparison of the primary structure of PSRPK and other SRPKs revealed that the conserved domains were almost identical; however, the nonconserved ≥ N and spacer sequence differed among the kinases. A cytoplasm localization signal was present in the spacer sequences of mammalian SRPKs. Further, the spacer sequence of PSRPK was considerably smaller than that of mammalian SRPKs. This difference might be the major reason why PSRPK cannot anchor itself in the mammalian cytoplasm. A classic NLS (cNLS) comprises a monopartite or bipartite signal. A monopartite NLS contains 1 cluster of basic residues, while a bipartite NLS contains 2 clusters of basic residues . Similar to the sequence feature of a monopartite NLS, the NLS of PSRPK is rich in basic residues. A monopartite NLS sequence that is located at the terminal of a protein is usually in a coil, while that located in the interior of a protein is usually in a loop. The PSRPK NLS is also located in the basic loop between 2 α-helixes (Figure 5). The close side chains of K320 and D325 form a salt bridge, thus forming a stable NLS Ω-loop motif (Figure 5C). The experimental results showed that PSRPK lost its nuclear localization ability following the deletion of 318 PKKGDK323 or mutation from K320 to T320. The deletion or mutation destroyed the Ω-loop motif of PSRPK, thus suggesting that the loop structure of PSRPK NLS controls the nuclear localization of PSRPK. The 318PKKGDKYDKTD328 sequence, which corresponds to the nonconserved sequences of SRPK1 and Sky1p, is located in the loop of an HLHM [18, 19] (Figure 5B). Therefore, studies on NLSs of SRPKs should focus on the loops in HLHMs. In this study, by truncation of PSRPK protein, deletion of and single amino acid substitution in a putative NLS and transfection of mammalian cells, we demonstrated that the 318PKKGDKYDKTD328 peptides localized in the C-terminal conserved domain of PSRPK with the Ω-loop structure could play a crucial role in the NLS function of PSRPK. Shide Liu, Zhuolong Zhou contributed equally to this work. SL carried out the design of the study, participated in all studies, and drafted the manuscript. ZZ carried out the most of the tests. ZL carried out confocal microscopy scanning. QO constructed partial plasmids. JZ participated all of the tests. ST participated in the study, and proofreading the manuscript. MX, conceived of the study, participated in its design and coordination.